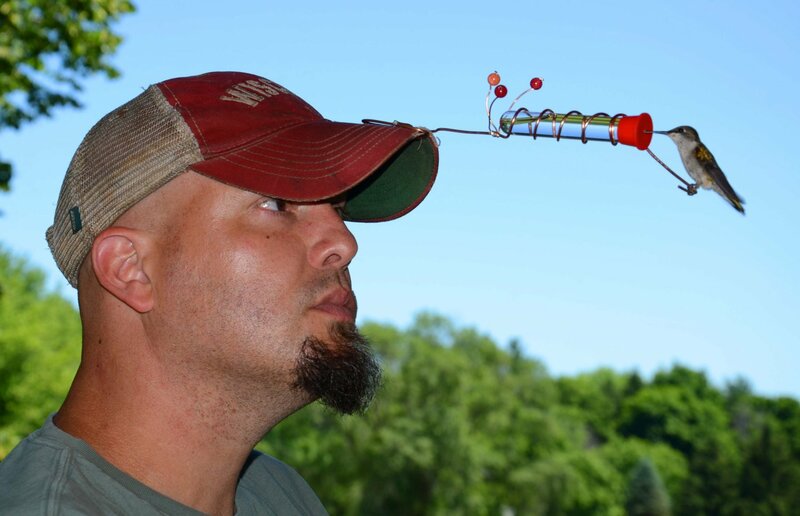 Here's something unusual: a hummingbird feeder that clips onto the brim of a baseball cap. Jeff Driscoll of Dubuque, Iowa makes and sells all kinds of other strange hummingbird feeders, including this one for $13.95. You can see them all over at his Etsy shop, Coppervine Feeders. This little feeder is made to attach to the beak of a hat or visor to give you a close up view of your hummingbirds. The end is shaped like a paperclip allowing you to easily slide it on the hat. It can also be used as a hand held feeder with the end providing an adequate handle. Three red berries were added to the feeder to help attract the birds and a perch for landing is on the end. The vial easily slides in and out of the copper coil for cleaning and filling. Please do not assume you will get hummingbirds to eat that closely if you don't have/feed hummingbirds. Those who feed hummingbirds and are outside when they eat know how close they can get and whether or not a feeder like this will work for them. It will not take long for birds to get comfortable and feed from your hand or hat. This 10 inch feeder is very practical and will provide an up close experience for you bird lovers. Hat needs to fit tight on your head to support this feeder. The number of hummingbirds sharing this pool is astonishing, given how aggressive they usually are toward each other.